Cook's Garden Favorite. 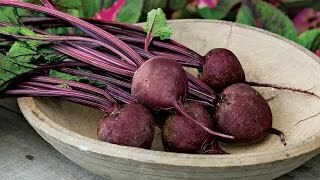 We make up this mix for those of you with small gardens, or who simply haven't yet discovered what a wonderful vegetable homegrown beets can be. Includes all the beets currently in stock (except Bull's Blood) to yield a variety of beets that mature over a long period of time. Mixed packet of seed. Sow beet seeds in well-worked, well-drained soil in full sun after danger of frost in spring. In frost free areas, sow in fall. Beets are sensitive to acidic soils and prefer a pH of 6.0 – 7.0. If your soil is more acidic, add Garden Lime as directed on the bag. Sow thinly in rows 12 inches apart and cover with ½ inches of fine soil. Firm lightly and keep evenly moist. Thin to stand about 3" apart when seedlings are 1-2" tall. Note that beet seeds are actually clusters of seeds and require more thinning than other crops. Pick the greens when they are 4-6 inches long and the roots are less than 2 inches in diameter. 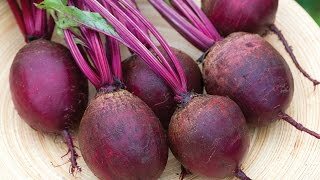 Harvest roots at 1 inch for baby beets, up to 3 inches for mature beets. Store fall-harvested beets at 33-35°F at 95% humidity. Cook beet greens like spinach. Beet roots can be pickled, grilled, baked or broiled. To prevent red beets from excessive “bleeding” in cooking, wait until after cooking to peel, remove taproots and slice. Trim off the tops about 1 inch above the roots and wash carefully with a vegetable brush. Boil until tender, then plunge into cold water. When cool enough to handle, slip the skins off with your fingers and remove the little taproots. Slice the beets, or serve whole. Beet, Cook's Custom Blend is rated 5.0 out of 5 by 1. Rated 5 out of 5 by Farmer Sam from These Beets! I am so very happy with these Beets! Can't believe how easy they were to grow, and I plan to put another crop in the ground in late August.